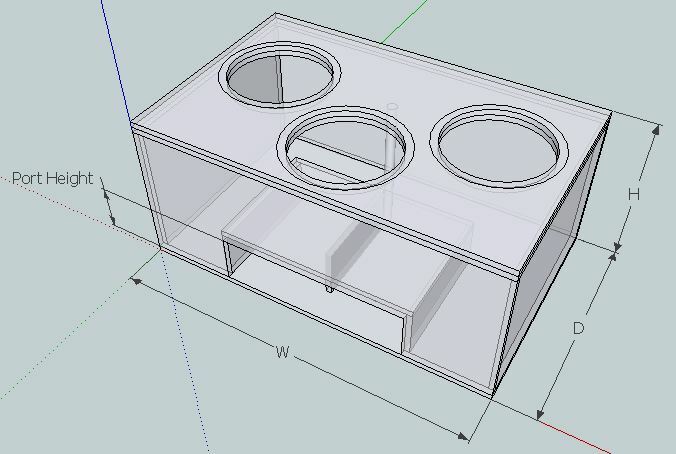 Is someone able to help me with building an enclosure for three zv5 15 d1. They're going in a nnbs tahoe. I've got one Crescendo 4.5k and plan to buy another in a few months. I listen to a variety of music but mostly rap, chopped and screwed. I love the lows. Depth should be measured from the top of your backseats to the rear gate, did you measure it like that? I was trying to leave space for batteries. I think I have another place for them tho. I was trying to keep the height around the window line but I can go higher if necessary. If that's the case max height is 40 inches, 36 if I measure at the very back at the hump. Any update on a design? You should also be able to fit 49 inches wide between the wheel wells. It will save you a few cuts if your using MDF since it comes at 49 inch widths. The carpet and padding underneath the carpet will flatten a fair bit allowing for 49. I havent ran across a tahoe or yukon of any generation yet that it didnt fit, unless your talking a 2018 but then I still think you should be fine. I would check it out, because that is a fair bit of wasted airspace your giving up otherwise, especially if your trying to stay under window line. NOTE: put effort to keep within your max dims but you will need to add more bracing than what the figure shows, I have factored in 0.2 cubic feet for bracing for you to use. I have an 07 Tahoe and it is 49 inches wide. Thanks joe. I'll give this a try. It is actually 49 inches wide. How much would it affect tuning if we adjust the numbers? As I stated before I don't need to stay at the window line. Would it be better if I go a few inches higher? 26 inches for the height wouldn't be so bad to me. As before, that is just for space analysis as you see it needs at least 6 1/2" inches to the rear gate + 31 1/4" box depth, is there enough space for the stuff you need to place there? or there's some extra depth available. 49W would gain you 0.2 cubic feet and tuning would stay almost the same. rethink your max dims, let me know what will be your total effective power (after all upgrades) going to the 3 subs and will take it from there. I'll make a cardboard cut out and try to visualize it better. I'll hit you back after I get my ideas together.